Leader of the gilds of Frankfort-on-the-Main against the Jews in 1612, and instigator of the riots which led to the expulsion of the latter from that city in 1614; he was hanged in 1616. 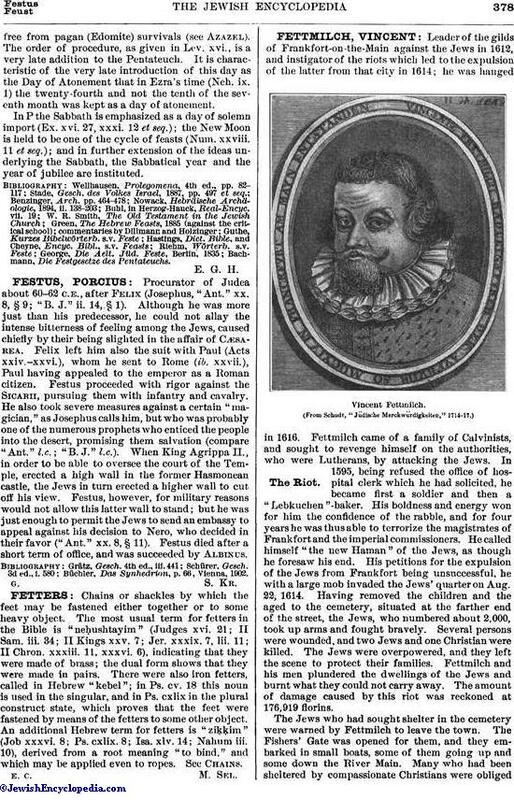 Fettmilch came of a family of Calvinists, and sought to revenge himself on the authorities, who were Lutherans, by attacking the Jews. In 1595, being refused the office of hospital clerk which he had solicited, he became first a soldier and then a "Lebkuchen"-baker. His boldness and energy won for him the confidence of the rabble, and for four years he was thus able to terrorize the magistrates of Frankfort and the imperial commissioners. He called himself "the new Haman" of the Jews, as though he foresaw his end. 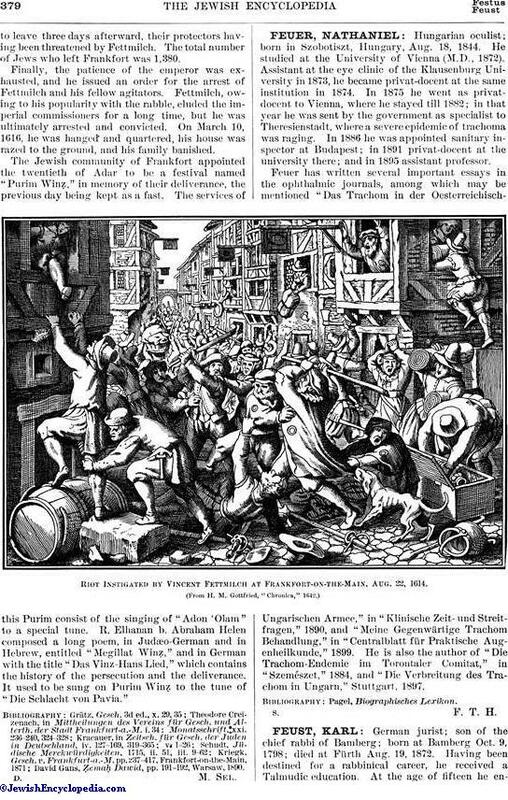 His petitions for the expulsion of the Jews from Frankfort being unsuccessful, he with a large mob invaded the Jews' quarter on Aug. 22, 1614. Having removed the children and the aged to the cemetery, situated at the farther end of the street, the Jews, who numbered about 2,000, took up arms and fought bravely. Several persons were wounded, and two Jews and one Christian were killed. The Jews were overpowered, and they left the scene to protect their families. Fettmilch and his men plundered the dwellings of the Jews and burnt what they could not carry away. The amount of damage caused by this riot was reckoned at 176,919 florins. The Jews who had sought shelter in the cemetery were warned by Fettmilch to leave the town. The Fishers' Gate was opened for them, and they embarked in small boats, some of them going up and some down the River Main. Many who had been sheltered by compassionate Christians were obligedto leave three days afterward, their protectors having been threatened by Fettmilch. The total number of Jews who left Frankfort was 1,380. Finally, the patience of the emperor was exhausted, and he issued an order for the arrest of Fettmilch and his fellow agitators. Fettmilch, owing to his popularity with the rabble, eluded the imperial commissioners for a long time, but he was ultimately arrested and convicted. On March 10, 1616, he was hanged and quartered, his house was razed to the ground, and his family banished. The Jewish community of Frankfort appointed the twentieth of Adar to be a festival named "Purim Winẓ," in memory of their deliverance, the previous day being kept as a fast. The services of this Purim consist of the singing of "Adon 'Olam" to a special tune. 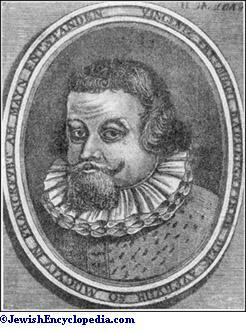 R. Elhanan b. Abraham Helen composed a long poem, in Judæo-German and in Hebrew, entitled "Megillat Winẓ," and in German with the title "Das Vinz-Hans Lied," which contains the history of the persecution and the deliverance. It used to be sung on Purim Winẓ to the tune of "Die Schlacht von Pavia." David Gans, Ẓemaḥ Dawid, pp. 191-192, Warsaw, 1890.